We are taking a group of 12 people through this book, and it is excellent. My husband and I are both trained mediators through Peacemaker Ministries, and this augments the peacemaking process so beautifully. It helps one learn to see when a conversation becomes crucial (opinions vary, stakes are high, and emotions run strong), creating an environment of safety so that those involved can contribute to the "Pool of Shared Meaning." I am excited to apply its principles. I am committed to improving the way I communicate with people! It is a lovely book, and I highly recommend it. You know that Core Value Prayer Study I mentioned in my last post? Well, the references are exactly the number of days between the Super Bowl and Easter this year. So, I am issuing a challenge for people to do that with me by applying the verses in this study on a daily basis. The passages are short every day and great for a devotional time in the morning. The applying and accountability will be the tough part. Find a group to journey with for accountability to apply God's Word for 76 days! My tongue is the pen of a ready writer. I will write my praise to You. You have done great things, and I will give You all the glory for this month and the focus on prayer. I love it!!! You have answered the prayers of Your servant, Carol. I love that Steve's sermons have gone right along with what You have been teaching me. I love the balance I have between Your Word and prayer after so many years of learning so many amazing things from Your Word while writing for the Bible Book Club. It was so worth it, but I like a slowing down of the mechanics involved with that so that I have more time, especially in the morning, for more focused prayer time. I remember all my thinking friends discussing Gladwell's book, Blink, and thinking it probably would not be something I would be interested in reading. I never would have read him had my book club not picked to read Outliers: The Story of Success. I started it reluctantly and quickly became a Gladwell fan. That book altered the way I looked at life. So, when this book came out and was recommended by my bookish sister, Adriana, I had to read it. Gladwell has done it again! I especially loved how he analyzed the long term success rate of going to an elite university if you are not at the top of your class versus going to an average school and being at the top of your class because the pool isn't as competitive. Fascinating! I highly recommend this book, and I loved listening to the author read his own book. I think I am convinced I need to go back and read Blink! Saw this previewed yesterday. Powerful. This is a classic, but I am not sure I had ever read through the whole book. WOW! My prayer time at the Trappist Retreat in Carlton, OR was lovely. I had just spent my annual New Year's Eve Day of Prayer at Teala's sorority (I think we have done it every year Teala has been a house mom other than when we were in Malaysia for two New Year's Eves - so that would 16 of the last 18 years! ), but I was on my way to Phoenix for a business trip when Terri (my like-hearted prayer buddy) texted me and asked if I wanted to go here for a three day silent retreat. I loved it. I had only been to Mount Angel Abbey Retreat Center and the Shalom Prayer Center among the Benedictine monks and sisters. So, I was up for a Trappist adventure (since I love Thomas Merton and all). This is 1300 acres of beautiful forest to hike and pray. I hiked for three hours and 6.5 miles, and half of that was UP hill with a 700+ elevation gain. I have read this multiple times, but this is the first time I have ever listened to it in audiobook form. Delightful! Brother Lawrence "prayed to God among the pots and pans" as he worked in the kitchen of a Carmelite monastery in Paris (1611-1691). This is simple and profound. You will love it, and it goes along very nicely with "The Game with Minutes" that I just posted about. Here is a link to the Librivox recording and a zip file of the book. It only takes 1 hour and 15 minutes to listen to, and I listened to it on one of my long walks. Made my whole day a lot brighter! This is really more a short essay, but it is profound and important. It is one of the best things I have ever read and applying it will change your life. This is a reread for me as I have paired it with my reading of Letters by a Modern Mysticby Laubach in the past, but it is good all on its own, and we have our Kingdom training groups read it every time we do this curriculum, and people usually really like it! We pair it with reading The Practice of the Presence of God by Brother Lawrence which I have read on a regular basis over the last 35 years. Laubach was like a modern day Brother Lawrence, but practicing God's presence in the midst of real life rather than in a monastery. 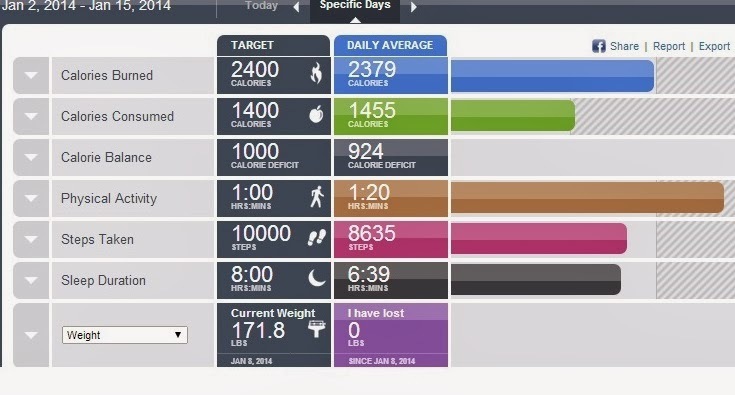 Here is a PDF download: "The Game with Minutes"
Here are my calorie goals. The consumed calories of 1455 average were only tracked through January 8th at which time I started traveling, and I have only been home 36 hours out of the last 7 days. I am just trying to hit my burn goal everyday, and I did not wear my BodyBugg for much of yesterday and a few other times when I was pretty active (one walk I forgot to wear it). So I think I did meet the goal. I wanted to go a bit deeper about what I do for accountability. Many years ago, I started a group called FACEyourday. Get ready to FACE your day with accountability and support from friends! F: Food - What are your goals for eating right? A: Academic or Attitude - What are you feeding your mind? C: Communion - How are you communing with God and others? E: Exercise - What are you doing to tune your temple? D: Daily Care - What are your goals for taking care of your loved ones and yourself? Here is an example of my FACED for yesterday that I just sent to my two accountability partners. I had someone ask me how I lost the weight, and I had written this email to a couple of friends a few months back. So I am going to just paste it here!